(Name) is a (city)-based abstract artist renown for her use of movement and color. Her poured painting technique utilizes color that turns, lifts, and travels across the surface. She is an experienced art instructor with a history of many successful art exhibitions. (Artist) has received many awards and honors for her art, including 1st Place, Best of Show, Signature Status, and Art Teacher of the Year. Her paintings have life, they lift, they energize heart, and they surprise the heart..
All levels welcomed! Participants will paint three or four 28” x 30” paintings while exploring all senses. Listen and feel what your intuition tells you to paint. We will be painting from your source - your heart and soul. Your Workshop fee includes 4 days of painting instruction, studio workspace, 2 tours, all art supplies except personal brushes, lodging, 7 breakfasts, farewell party and gallery exhibit. The week-long workshop and lodging fee ranges between $XXXX and $XXXX contingent upon your room selection. COME EXPLORE YOUR CREATIVITY IN SAN MIGUEL DE ALLENDE, WORLD FAMOUS FOR ITS ARTISTIC HERITAGE. This one-bedroom air-conditioned suite has its own plant-filled terrace along with outdoor seating for two. The hand-painted tile kitchenette has many windows with a pretty view, counter seating, and a sitting area with a couch, coffee table and tow chairs. Cable TV is in the living area. There is a private bath with shower. Two twin beds can be made into a king if preferred. This third story studio air-conditioned apartment has an open floor plan which includes a kitchenette, table and two chairs, an Equipali couch and chair, and cable TV. A closet separates the king bed (may also be 2 twins) from the main space. There is a private bath with shower. At the rear there are French doors to a second flower-filled terrace with a table and seating for two. For the view-lovers, there is a steep stair to the top-level terrace with 360 degree views. This one-bedroom air-conditioned apartment has the largest living space with a couch and 2 comfortable chairs facing a large fireplace. The living space also has dining table and seating for 4 as well as a writing desk and cable TV. A talavera-tiled kitchenette has all the basics. The bedroom has a walk-in closet and private tub with overhead shower. Twin beds easily convert to a king-size bed. To reserve Madam's Suite, use the PayPal button here. 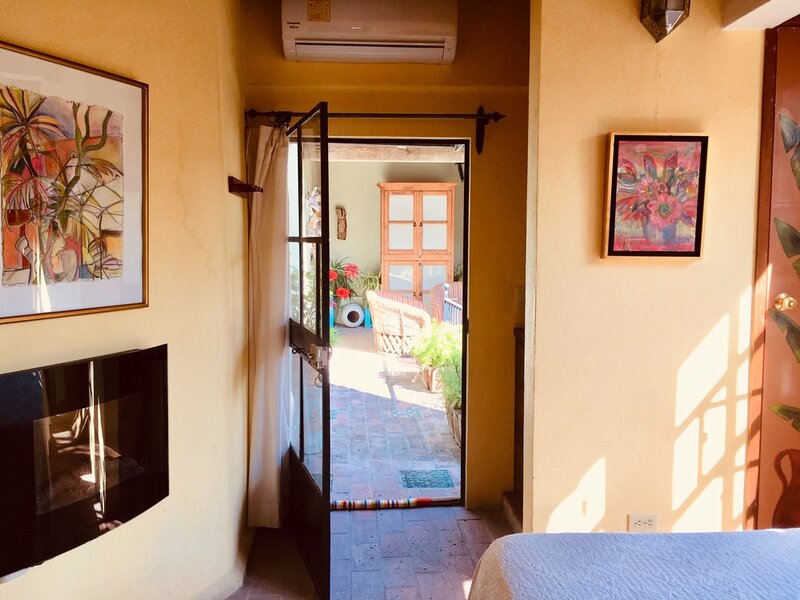 The air-conditioned Paloma Loft is on the second floor of the Besitos Garden complex and has a balcony overlooking the garden courtyard. In addition to a small bath with shower, it also has a mini-kitchen and access to an open terrace and enclosed atelier. The Paloma can be rented with two twin beds or one king size bed. This room connects to the open-air meeting space which can be used for art, yoga, dance or other workshops. The First Kiss room has a queen-size bed, with antique armoire and original art and has an en-suite bathroom with a tub and shower. It has a view of the distant hills and a glorious jacaranda tree from the bath and bedroom windows. The Kiss Me Again air-conditioned room overlooks the bordello’s original dancing pavilion and may be made up as twin beds or one king bed. It has a working gas fireplace and hand-painted tiles in the en-suite bath with shower. Original art, high beamed ceilings, and a delightful view contribute to a charming experience. 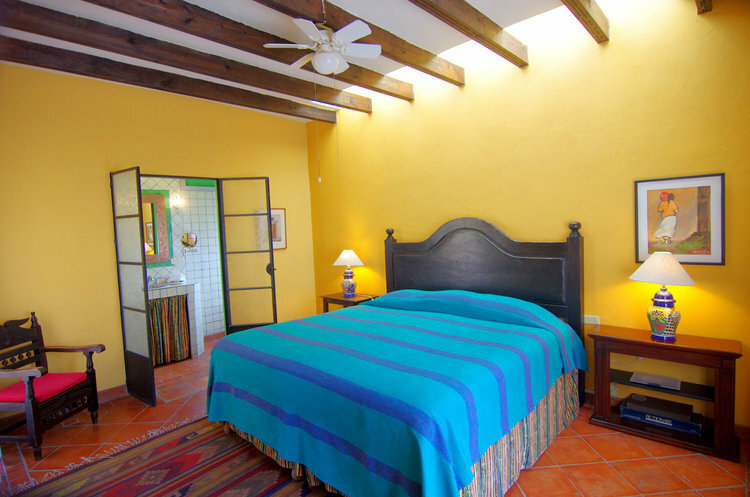 The owner’s former quarters, La Tura’s Suite has a Queen-size bed, with antique armoire and original art from well-known Mexican and American painters adorning the walls. It also features an en-suite bathroom with a tub, double sinks and separate shower. It has a beautiful stained-glass window in the bathroom that affords light and privacy. The bedroom has an ornamental fireplace, seating for two, and a small table. Wi-Fi, cable TV, purified water, small fridge, microwave, and in-floor heating keep this room always comfortable. The location is secluded from other rooms, offering extra privacy and a view of the fountain patio. The Hummingbird air-conditioned room is a king or twin-bedded room that faces out into the garden. It has a private bath with tiled shower. Santa Fe styling and original art give this ground floor room a nice flair. 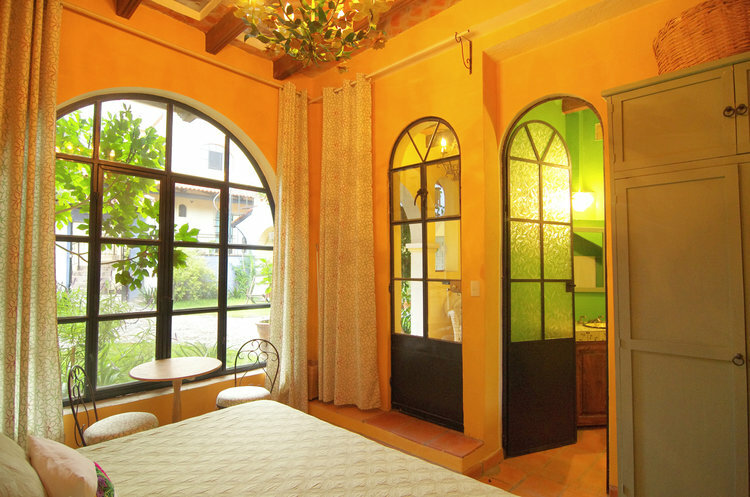 The Mariposa room, with its large arched windows facing the Garden, is perfect for an artist or nature lover. It may be made up as a king or two twin beds and a private bath with shower. 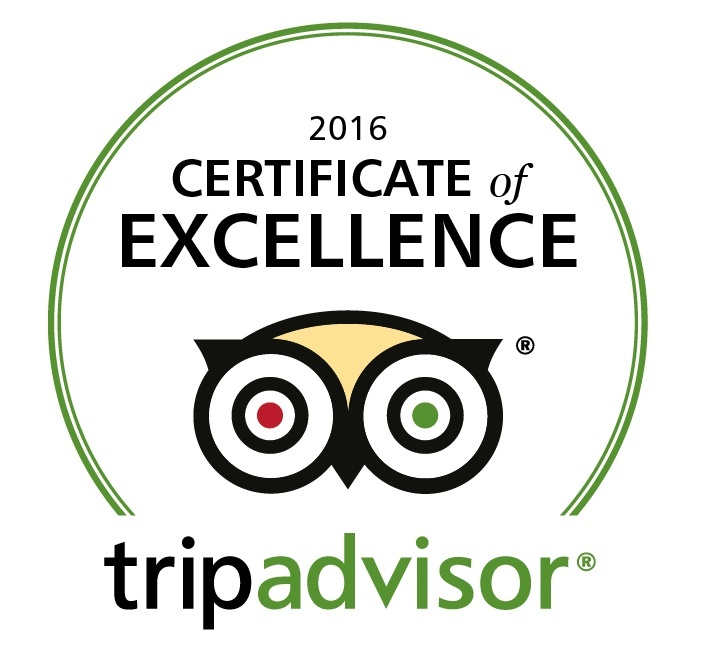 It is located on the ground floor across from the Besitos Garden Kitchen and Sala. 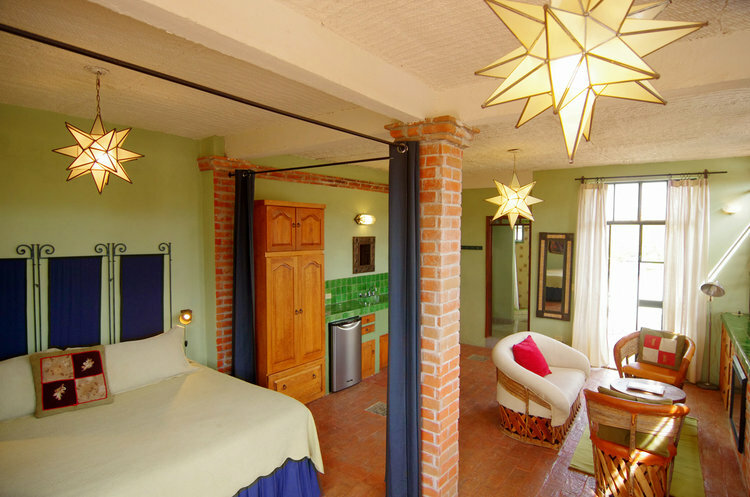 The Dragonfly air-conditioned room faces out into the courtyard and has 2 twin beds or one king and private en-suite bathroom with Mexican-tiled bathtub and overhead shower. It is adjacent to the Besitos Garden Kitchen and Sala. The Jovita air-conditioned room is cozy with lots of light and a pleasing view. It has a queen bed with carved headboard, extra shelving and a small chair. It has a private bath with shower, and an electric fireplace for cozy nights. A nearby covered outside sitting area has a wicker couch and chairs and unusual ceremonial masks on the wall. This room has easy access to the Project Room and terrace. Chiquita room is the first of four “working girl” rooms, each with its own personality. This is a cozy room near the main dining room. It has very high ceilings and a queen-size bed. There is a small gas fireplace, and chair and small table, as well as en-suite bath with shower. Nearby, there is a garden sitting area and fountain. 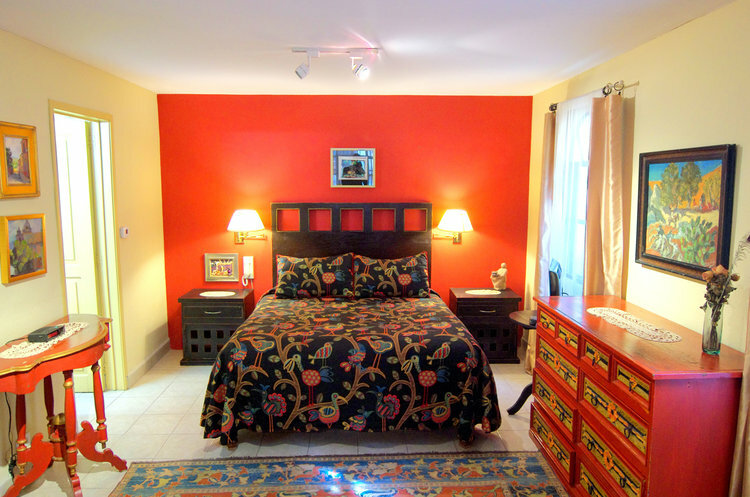 The Pepita room is a cozy space with a queen-size bed, ½ stone wall, ½ antique tiled wall, and a hand painted desk and dresser combination and chair. It has a private bath with shower. Original Rubin Morales paintings are on the wall above an electric fireplace. Outside there is sitting alcove, also a nearby fountain.